According to Texas A&M, vines perform functions that many other plants cannot. Vines shade, screen, shelter and obscure objects. They come in various colors, and produce a variety of fruits and vegetables. In Texas, spring is the best season for planting vines to cover a hot, sunny exposure. Planting your vines in the spring will allow the plants to become established before the extreme hot summer heat arrives. Vines grown against the hot western exposures will require more water than almost any other plant in your landscape. According to PlantOfTheWeek.org, the coral vine (Antigonon) withstands the heat and sun extremely well. Coral vines are fast-growing vines, reaching 35 to 45 feet high. Their bright pink flower clusters arrive late summer and fall. Coral vine foliage is dark green, and evergreen in frost-free areas of Texas. They come back vigorously from their roots the following spring. Coral vines climb with tendrils. They make a good cover for patios, and an excellent screen over large brick walls. Keep the vines well watered in the hot summer months. According to Clemson University, the Carolina jessamine (Gelsemium) is a highly adaptable vine. They will thrive in sun, part-sun or shade exposures. They are compact and bushy. Carolina jessamine vines reach 10 to 25 feet. In southern Texas, they are evergreen in color. In northern Texas, they are semi-evergreen. Carolina vines flower early in the spring. The bright yellow flowers are fragrant. They climb by twining. Carolina Jessamines are good on fences, over patios and trailing over rock walls. According to TheFlowerExpert.com, morning glories (Ipomoea) thrive in sun or partial sun. They are vigorous plants that reach 8 to 15 feet at maturity. Morning glories flowers are sky blue, rosy red and white. They bloom best when not heavily watered or fertilized. They are a good cover for fences and walls. Morning glory flowers bloom open in the morning, and remain open much of the day. According to Boyd Nursery Company, Boston ivy (Parthenocissus tricuspidata) thrives in sun or partial sun. 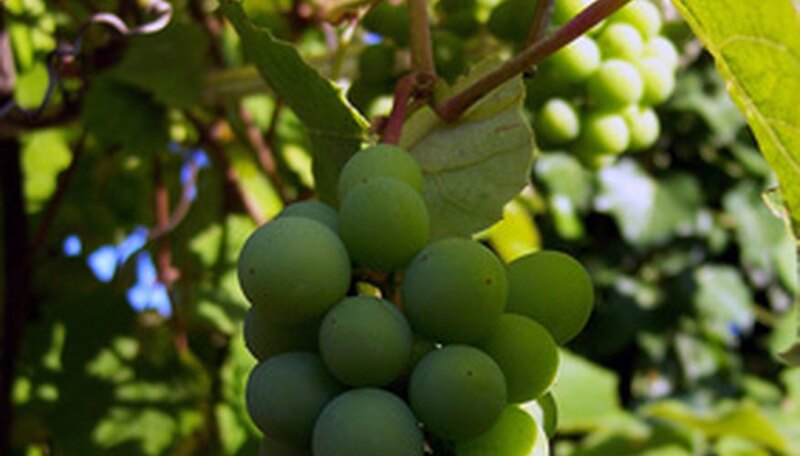 They are vigorous and durable clinging vines that reach 25 to 40 feet at maturity. They change colors with the seasons. Their leaves are bright green in the spring, dark leathery color in the summer and turn a radiant scarlet red in the fall. In the winter, bare twigs trace where the leaves once were. Boston ivy is an excellent energy converter; the leaves soak up heat in the summer, and allow the sun’s rays to shine through in the winter. Stephanie Nolan has been a freelance writer since 2005. Her articles appear on various websites, where she specializes in topics about home improvement, parenting and interior design. Nolan holds an Associate of Applied Science degree in business management from the University of Phoenix.